Sorry for not posting in a long time. If you’d like more up-to-date info and offers, please like and follow our Facebook page. Thank you. No coupon needed. Discount will be shown in the shopping cart. 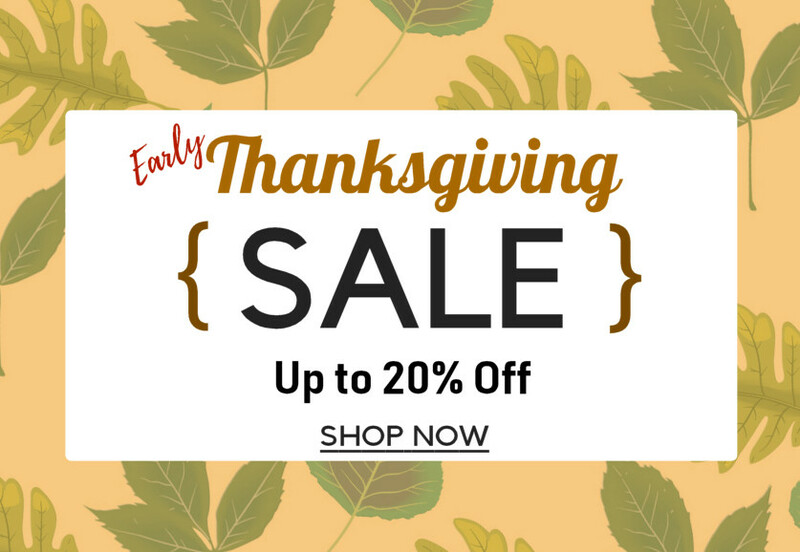 Excludes Electronics, Manicure Pedicure supplies, and Gift Card. Offers valid from Nov 12 – Nov 18. This huge discount only happens ONCE a year. So SHOP now! SPRING SALE! 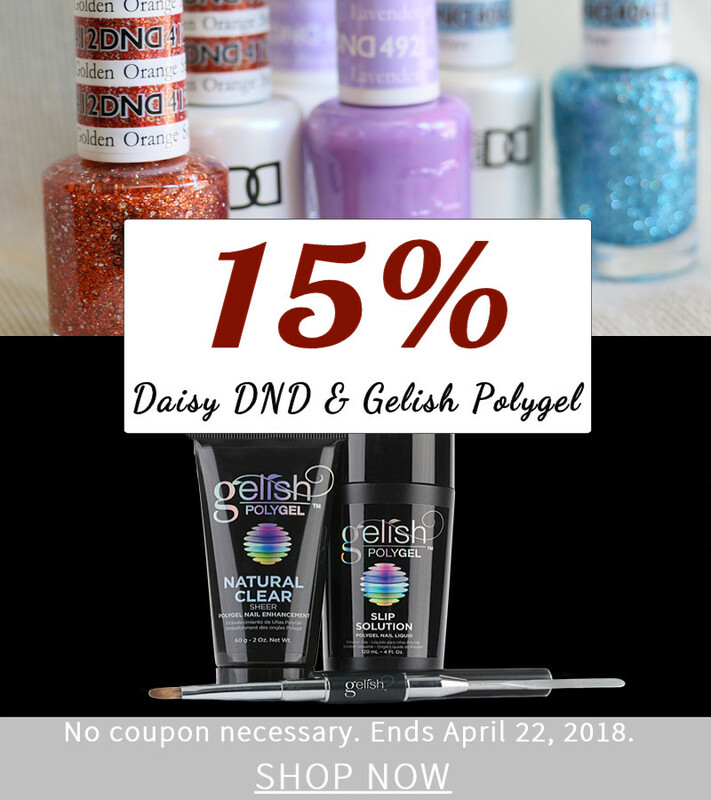 Save 15% off Daisy DND Duo Set and Gelish Polygel products. No coupon necessary. Hurry, because the offer ends in less than 4 days. Offer is only available at EsthersNC.com, your online source for your favorite brands of professional gel polish. Visit us online at www.esthersnc.com. Can you resist Gummies, Jellies, Candies and Taffies ? We bet you can’t. 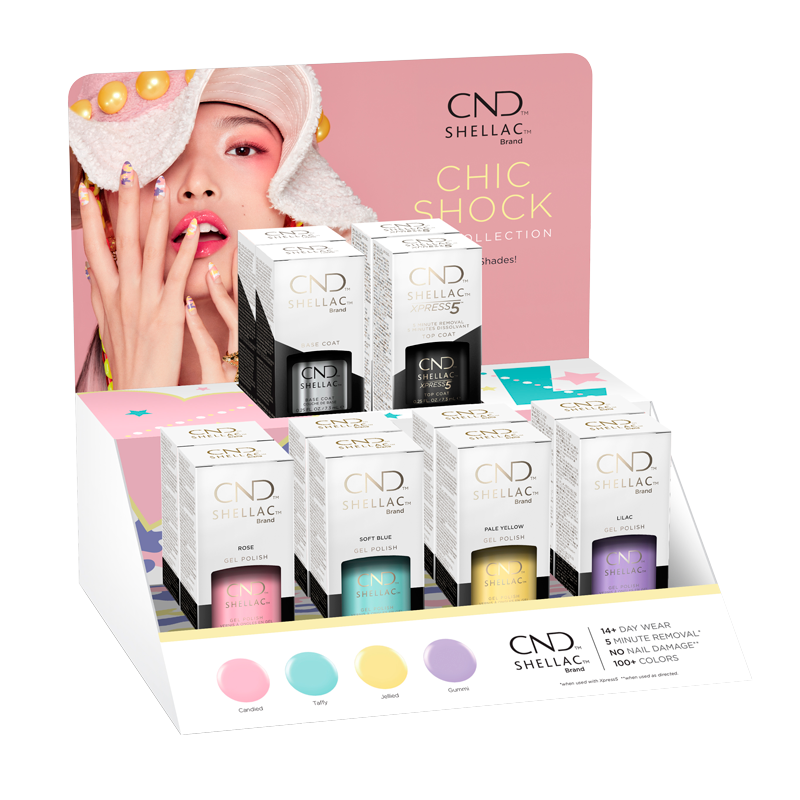 With four new alluring colors for every day wear or fantastic nail art, CND Chic Shock collection will become your new favorites this spring! This collection has the first introduction of CND’s new logo, branding, and packaging. I guess that’s just the trend now with the other brands releasing their new fresh look and packaging. Do you like our special deals? Join our newsletter or like our Facebook to get our monthly coupon, new product updates and special deals. These offers are only available at www.EsthersNC.com. We have over 200 colors of Daisy DND, Top and Base Coats. Please note that our office will close for holidays on December 25-27 and January 1-2, 2018. All orders received during this time will be processed the next business day. This year we’ll have something new. We’re gonna have a SWEEPSTAKES to win a $20 Esther’s Nail Center Gift Certificate by sending us your photos of Daisy DND application on your nails. 1. 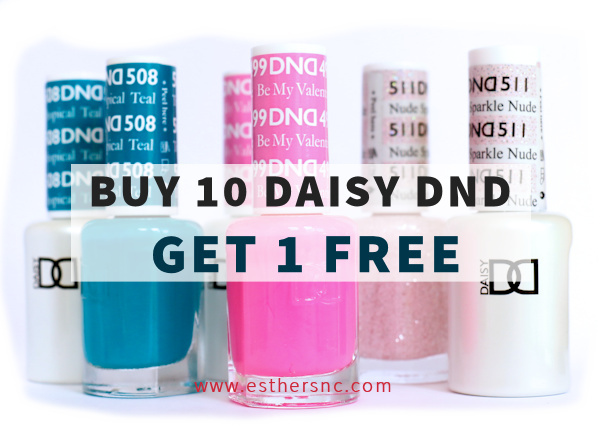 Get an entry by sending a clear and sharp photo of your Daisy DND (any color) manicure or pedicure application on your nails, for example this photo below. Stick swatch and such are not accepted. Multiple entries are fine as long as they have different colors. 2. Email it to info@esthersnc.com with your full name and the Daisy DND’s name and number used in the photo. 3, Sweepstakes will close on 2/6/2017 and it will be announced in February newsletter, blog post and on Facebook. 4. Submitting your photos will give Esther’s Nail Center the right to use and publish your photos without compensations. 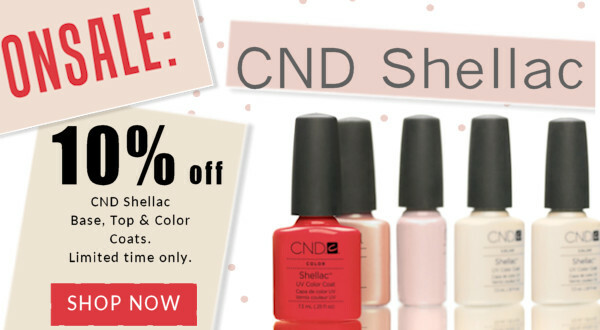 CND Shellac is on SALE! CND Shellac Sale is going on right now. 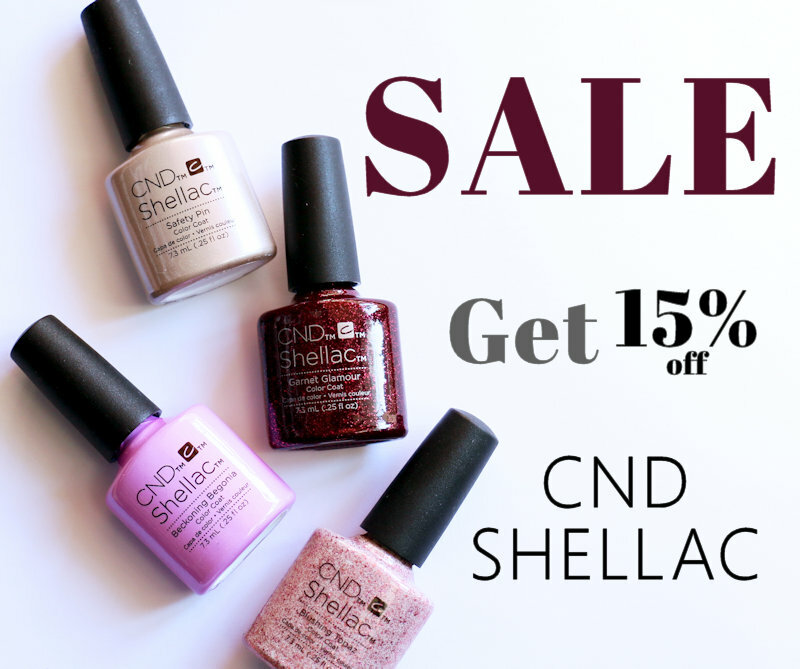 Save 10% off CND Shellac base, top and color coats. Valid until 9/11/2016. No coupon needed. Discount will be shown in the shopping cart. SHOP NOW. 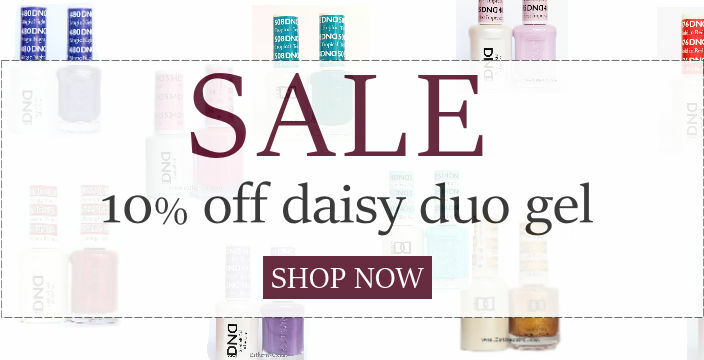 Daisy Duo Summer Sale is going on right now. Save 10% off the regular price. 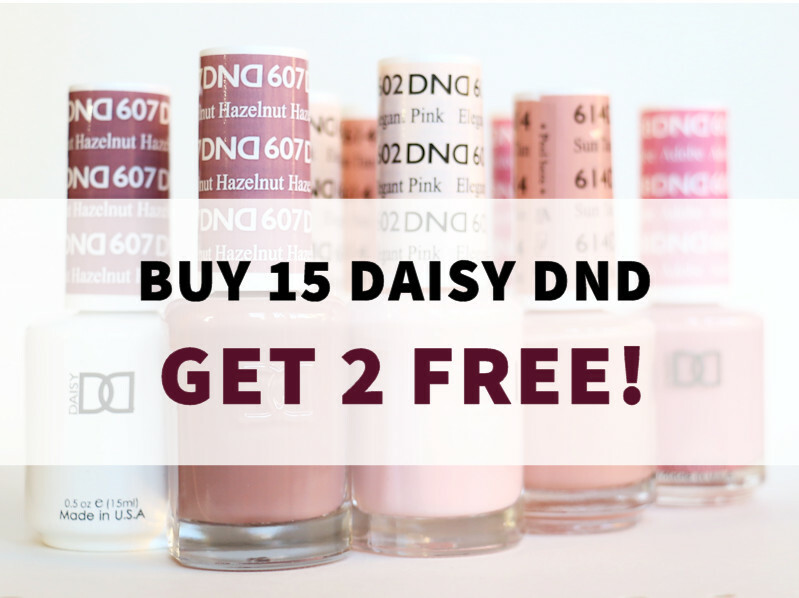 The discount applies to all Daisy DND products. However, it’s for a limited time only. To be precise, until 8/14/2016. So hurry and get some Daisies for your bouquet now!